NDP leadership candidates have been announcing new endorsements in the run-up to Sunday's final official debate before voting begins, but not all endorsements are created equal. 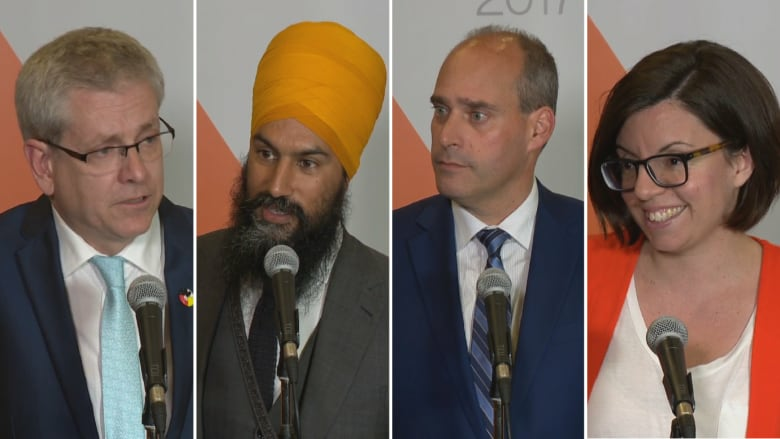 The four candidates for the leadership of the federal NDP are participating in the campaign's last official debate in Vancouver on Sunday, little more than a week before voting begins. Many New Democrats, however, have already weighed in, throwing their weight behind one of the contestants for the job. Ontario MPP Jagmeet Singh still has the most endorsements in the race, both from within the caucus and in the wider NDP universe of current and former legislators at the provincial and federal levels. In a contest that has been difficult to gauge from the outside, what can those endorsements tell us about the chances each candidate has of winning it all? As of Friday, Singh topped the list with 30 endorsements from current or former New Democrats who have held elected office, followed closely by Ontario MP Charlie Angus's 27 endorsements, Quebec MP Guy Caron's 19 and Manitoba MP Niki Ashton's 11. The contestants have been trying to one-up each other with endorsements this past week, with Singh announcing the backing of B.C. MP Peter Julian, who was a leadership candidate himself before dropping out of the race in July; Angus getting the nod from Peter Stogran, a veterans advocate who was also (briefly) a leadership contestant; and Caron announcing the endorsement of Brian Topp, who finished second to Tom Mulcair in 2012's leadership race and who has a long history of working behind the scenes for the NDP at both the provincial and federal levels. Among the federal caucus of 44 MPs, Singh has the most support with eight members, followed by Ashton and Caron at five each and Angus at two. About two-thirds of the caucus, excluding those who are in the running and others who must remain neutral, have decided to back one candidate or another. Some high-profile or long-standing MPs have stayed on the sidelines, however, including B.C. MPs Nathan Cullen (the third-place finisher in 2012), Don Davies and Fin Donnelly; Alberta MP Linda Duncan; Ontario MP Irene Mathyssen; and Quebec MP Alexandre Boulerice (who initially endorsed Julian). With voting beginning on Sept. 18 and the results of the first round of voting being announced on Oct. 1, New Democrats who have yet to publicly back a candidate have little time left to make a decision. Caron is trying to use endorsements to build some last-minute momentum. The number of prominent New Democrats endorsing him has exploded in recent weeks. On July 13, Singh had 17 endorsements, Angus 11, Caron five and Ashton four. Though Angus has announced more new endorsements than anyone else since then (16 compared to 14 for Caron, 13 for Singh and seven for Ashton), Caron has nearly quadrupled his backers. And they include some big names. In addition to Topp, Caron has also announced the endorsement of former Newfoundland and Labrador provincial leader Lorraine Michael as well as Alexa McDonough, who led the federal NDP between 1995 and 2003. Having backers like Topp and McDonough gives Caron credibility within the rank and file of the NDP. But he has few other metrics pointing in his favour. He had raised the least amount of money through to June 30, the last date for which fundraising data is available. The last Mainstreet/iPolitics poll of pre-existing members gave him just 17 per cent support among decided voters, and Quebec — Caron's home base — has just 4,900 of the 124,000 members eligible to vote, or roughly four per cent of the total. Even then, Singh claimed to have signed up more than 1,200 of those Quebec members. As Caron's difficulties indicate, endorsements only matter if they bring votes along with them. A big name can influence some members without any further effort, but the best endorsements come from figures who have political capital to spend and organizations to deploy. Those tend to be active politicians. That is why Singh's endorsement advantage may be bigger than it looks. Singh has 26 endorsements from sitting MPs, MLAs and MPPs, including 24 from Ontario and B.C. These two provinces account for 68 per cent of all members eligible to vote in the leadership, making them absolutely decisive. By contrast, Angus has only 10 endorsements from active politicians, just four of them from Ontario and B.C., while Ashton has eight and Caron has six (and only two from B.C. and Ontario). But each of the candidates also has endorsements from outside the political class. Indigenous activists, labour leaders, environmentalists and artists have also weighed in. They might have networks that are more difficult to gauge. Nevertheless, some general conclusions can be drawn from the endorsements. Singh has the most backers and is particularly strong among current politicians in the two provinces with most of the members. Angus has a lot of endorsements as well, but primarily from people who are no longer practising politics full time. Caron has some of the biggest names, but the fewest active politicians and too few in Ontario and B.C. Ashton has decent caucus support, but her endorsement roster does not stack up well with those of her rivals in quantity or profile with the broader membership. Or it can be put more simply. New Democrats as a whole are largely divided over who should lead them. Those with the most skin in the game and the most at stake in the short term, however, are lining up behind Singh. Perhaps they think they see where the winds are blowing. MPs (8): Randall Garrison, Peter Julian, Jenny Kwan, Hélène Laverdière, Alistair MacGregor, Brian Masse, Tracey Ramsey, Kennedy Stewart. Former MPs (1): Mylène Freeman. Ontario MPPs (9): Catherine Fife, Cindy Forster, Jennifer French, Wayne Gates, Lisa Gretzky, Percy Hatfield, Michael Mantha, Taras Natyshak, Peggy Sattler. B.C. MLAs (8): Harry Bains, Judy Darcy, Rob Fleming, Ravi Kahlon, Anne Kang, Lana Popham, Bruce Ralston, Rachna Singh. Manitoba MLAs (1): Nahanni Fontaine. Former Ontario MPPs (2): Rosario Marchese, Jonah Schein. Former B.C. MLAs (1): Jane Shin. MPs (2): Carole Hughes, Christine Moore. Former MPs (10): Charmaine Borg, Andrew Cash, Ray Funk, Claude Gravelle, Matthew Kellway, Wayne Marston, Pat Martin, Rod Murphy, Jamie Nicholls, Mike Sullivan. Territorial leaders (1): Liz Hanson (Yukon). Former provincial leaders (1): Ray Martin (Alberta). Ontario MPPs (3): Gilles Bisson, France Gélinas, John Vanthof. Nova Scotia MLAs (2): Dave Wilson, Lenore Zann. Manitoba MLAs (1): Andrew Swan. Saskatchewan MLAs (1): Buckley Belanger. Former Manitoba MLAs (3): Becky Barrett, Jennifer Howard, Eugene Kostyra. Former B.C. MLAs (2): Robin Austin, Evelyn Gillespie. Former Nova Scotia MLAs (1): Mat Whynott. Former federal leader (1): Alexa McDonough. MPs (5): Robert Aubin, Ruth Ellen Brosseau, Scott Duvall, Anne Minh-Thu Quach, Karine Trudel. Former MPs (6): Chris Charlton, Jean Crowder, Rosane Doré Lefebvre, Yvon Godin, Lorne Nystrom, Craig Scott. Former provincial leaders (2): Howard Hampton (Ontario), Lorraine Michael (Newfoundland and Labrador). Ontario MPPs (1): Peter Tabuns. Former Manitoba MLAs (3): Theresa Oswald, Erin Selby, Stan Struthers. Former Ontario MPPs (1): Shelley Martel. MPs (5): Sheri Benson, François Choquette, Georgina Jolibois, Roméo Saganash, Brigitte Sansoucy. Former MPs (3): Paulina Ayala, Joe Comartin, Raymond Côté. Manitoba MLAs (2): Amanda Lathlin, Flor Marcelino. Ontario MPPs (1): Cheri DiNovo. An earlier version of this article indicated that B.C. MP Gord Johns had endorsed Niki Ashton. Though she thanked him on Facebook for calling her "this campaign's Bernie Sanders," this was not a formal endorsement. Figures in this article have been corrected accordingly.